At 4 Corner IT, our main concern is making IT services and computer support as easy and efficient for our clients. In the West Palm Beach area, we boast a collection of services that enable 24/7 remote IT support, security, backup, monitoring and much more – all for one flat rate. Focusing your tech efforts and using an outsourced IT service company could be the best thing for company – eliminating in-house IT management and still offering 24/7 tech support for one flat-rate per month. 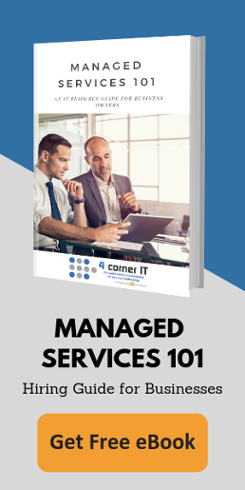 This not only removes the hassle of hiring and managing your own IT Department – but it opens up your resources for more important pursuits, such as completing business plans. For more information regarding this innovative way to tech, call 4 Corner IT to speak with one of our technical advisers, or fill out the form on this page, and you too can be equipped with instant and efficient IT management.